BOHO MARKET: It began with an inspiration board..
Oh, I love inspiration boards!! They are like a mix of different things you like...prints, colors, fabrics, magazine pictures, photos, fashion trends, accessories, nature..you name it! 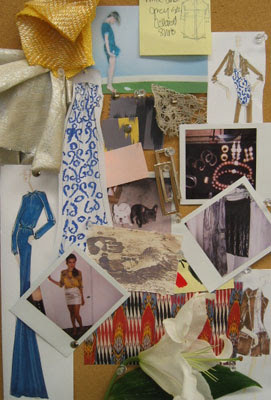 An inspiration board is a piece of you reflected with different elements. It's a great start whenever you want to design something and the great thing is that you can make it as the way you like. Once you have collected all the little things for your board just begin the process of editing. Spread all the pieces out on a table and start picking the ones you like the most. Favorite color combinations, textures, prints, expressive images, etc, will be coming together to become a whole. Try to relate things that can be part of one theme so you can get to your final inspiration in a better way. Once you finish the process of editing, save the rest of the pieces that you're not going to use because you might need them again for this board or another. Oooh, inspirations boards! 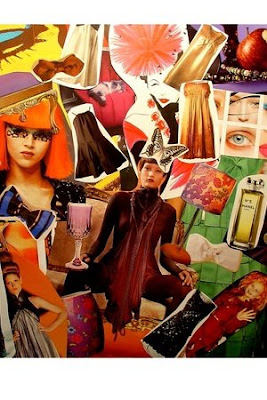 I've been thinking of doing a dream collage, but I love the idea of using more than just magazine cut-outs and photographs... "prints, colors, fabrics," etc! Yours are lovely by the way! I am using Dreamweaver CS3 to create my website. I upload and everything goes fine except the words that I attach a link to disappear and you cant see it on the website. does anybody know what the problem is?